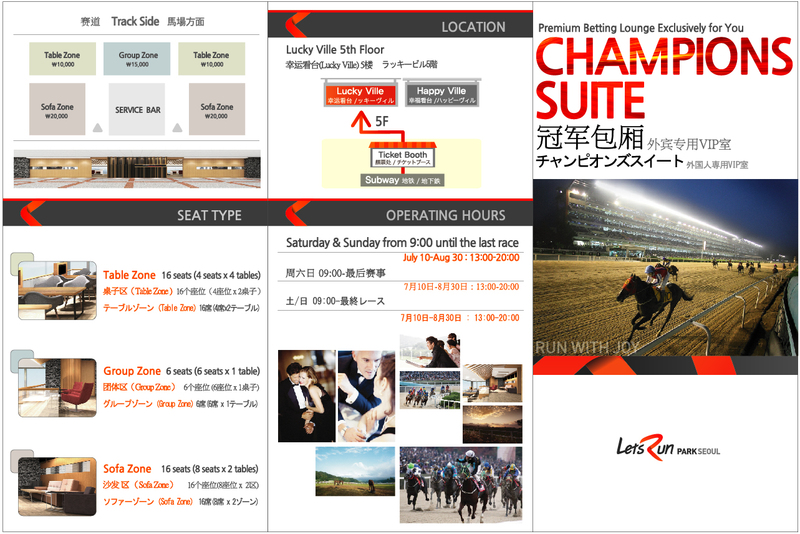 Seoul Racecourse has opened the “Champions Suite” a dedicated lounge for foreign punters on the fifth floor of the Luckyville Grandstand. The room had a “soft” opening last weekend but will open formally this Saturday July 18. The lounge is open to anyone in Korea with a foreign passport or Alien Registration Card (one Korean guest per person is permitted). 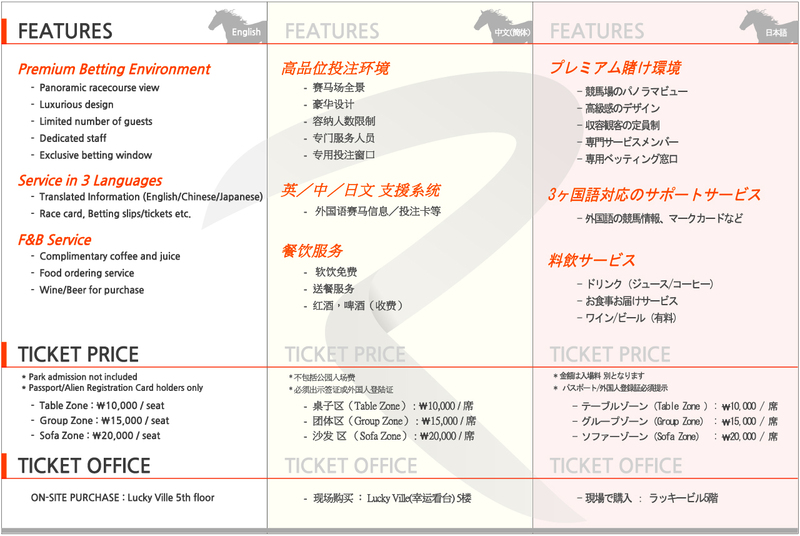 Racecards are available in English, Japanese and Chinese and there is both a staffed and automated betting window in the lounge which is situated immediately below the main VIP room midway down the home-straight and has an excellent view of the racecourse as well as TVs on each table. Until the end of September, all seats in all zones will be priced at 15,000 won per person per day. Tea, coffee and soft drinks are free of charge while beer and wine is for sale. Lunch may also be ordered in from the Owners’ Restaurant and like the rest of the course there is free high speed wi-fi avaialable. The lounge has a capacity of 38. 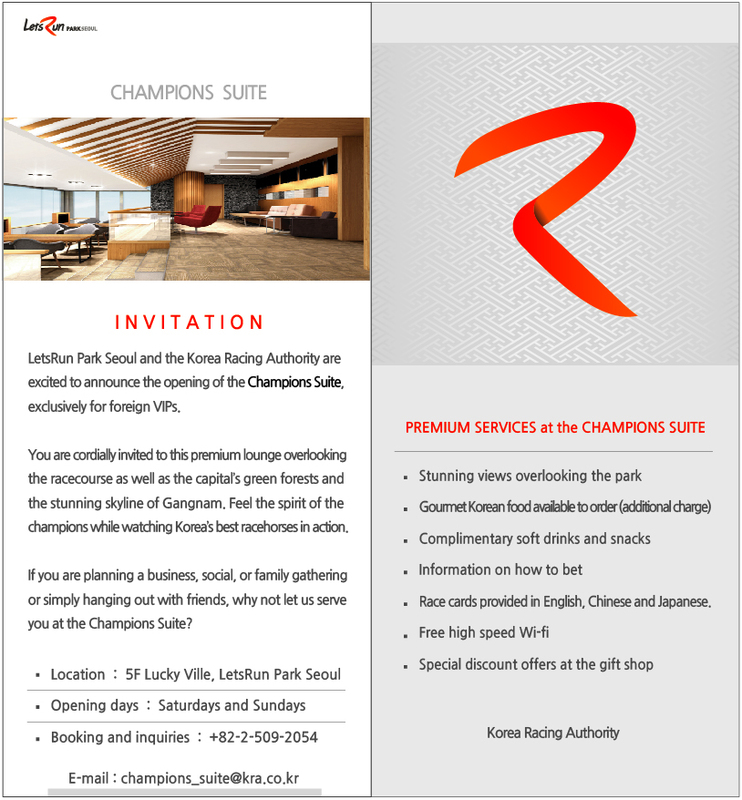 Reservations may be made in advance – and there are still seats available for this Saturday’s official opening which will be attended by the Chairman of the KRA (email hrikorea@gmail.com or champions_suite@kra.co.kr to make a reservation) – or on the day at the Champions Suite. Any of the information desks at the racecourse will help with directions. A day at the races just got a lot more comfortable! they should have one of these in busan.